And we bet your guests won’t even know! Perfect sized bites for your Thanksgiving appetizers! Simple, whole ingredients such as mushroom, walnuts, garlic, shallots, sage, rosemary, thyme, cranberries and nutritional yeast flakes for the ‘bread crumb’s’ – 100% vegan plant based and gluten free! Vegan comfort food is what it’s all about this season! Indulge in your family favorites without that tired feeling at the end of the meal! Shepherd’s pie is a favorite for sunday dinners or your plant based Thanksgiving. 4 simple ingredients for this fall classic! Recipe calls for unsalted butter but we recommend using earth balance for a plant based thanksgiving! Try our favorite Roasted Sweet Potatoes with Lentil and Quinoa dish as heartier version! What’s Thanksgiving without stuffing?! 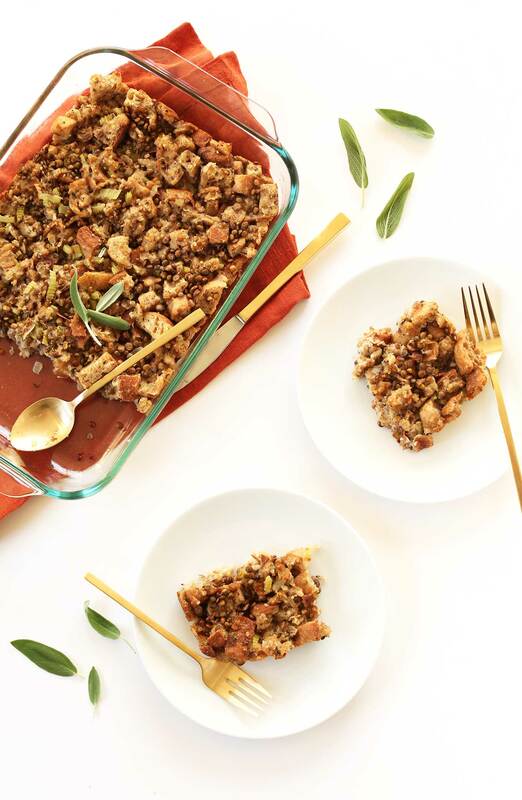 Try this simple vegan stuffing recipe that we swear is better than the original! Gluten free? Pick up gluten free bread crumbs from Whole Foods – they stock them seasonally! Warm, buttery mashed potatoes! A signature dish for the holidays and probably the easiest to make vegan! This fabulous recipe uses cashews instead of cheese and unsweetened almond milk instead of milk. 100% vegan and who doesn’t love green bean casserole? Let’s be serious. The breadbasket needs an update. Impress your guests with this veggie packed, whole-grain loaf. Best part? It’s gluten free! Roasted turmeric chickpeas and multi colored carrots topped with a light apple cider vinegar dressing. Add a few brussel sprouts to make the recipe your own! Thanksgiving wouldn’t be complete without a plant based vegan gray! Replace the flour in the recipe with rice flour to make gluten free friendly. Real food. Who said dessert couldn’t be healthy? These are just so good that we gave them two photos on the blog! Rich, sweet and the perfect way to end your plant based Thanksgiving! Treat your guests to a warm drink at the end of the night. A great alternative to coffee and definitely a specialty! Let us know your favorite plant based vegan recipes to share! Next New Year, New You. Wonderful ideas non-vegans would love. Very true 🙂 Thanks for commenting! Thank you, Shay. These look amazing.